Rembrandt van Rijn, 1606-1689, another of the Netherlands’ famous artists in art history, painted one of his of his most famous paintings, " The Blinding of Samson" in 1636. He was influenced by Caravaggio's religious art paintings where Caravaggio took time old bible stories and placed them in modern day settings. A good example is "The Calling of St. Matthew", 1599- 1602. The setting is the local corner tavern and the main characters are local street people. 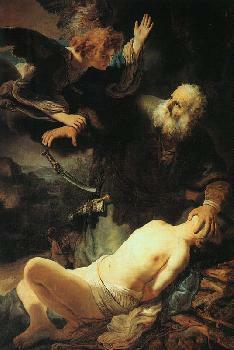 Rembrandt used this same story telling device in the famous painting "The blinding of Samson" 1636. Describing the artwork Delilah has deceived Samson, cut off his hair, and robbed him of his great power. Making sure Samson is no longer a viable enemy, the soldiers are actively destroying his eyesight. The action is theatrical and dramatic, a mature Baroque art style. Two Philistine soldiers have tackled Samson holding him on the ground ready for the spear bearer. Arms and legs are flailing. The intense light streaming in from outside the tent, almost totally silhouetting the spear bearer heightening the drama. Using a Flemish art characteristic of Peter Paul Rubens’ painting "St. George and the Dragon", 1606-10, van Rijn painted the soldiers armor highly detailed and reflective. Another famous painting by Rembrandt is "The Night Watch", painted in 1642. "Night Watch", captures the excitement of the moment using dramatic Baroque lighting and active figures. The militia company is assembling for the visit Marie de' Medici to Amsterdam. van rjin painted enough portraits of himself over his lifetime to record all of his stylistic art changes. In his "Self Portrait", 1666, he uses the frontal engaging view of Jan van Eyck's, "Man in a Red Turban", 1433. The portrait is straight forward, very detailed, not the ideal representation of the High Renaissance. Bringing out his own personality and essence in the portrait, Rembrandt painted the effect varying degrees of light and shade have on a face. He found that different light intensities and contrasts could bring out different emotions and feelings. The portrait is quite different from the Baroque, cavalier, aristocratic pose of Anthony van Dyck's, < FONT>, painted in 1635. Van Rjin painted one of his famous paintings "The Return of the Prodigal Son", in 1665. Since "The blinding of Samson" his style softened and mellowed. Gone are the highly active, dramatic strongly lit theatrical settings, replaced by a moodier, more emotional, softly delineated picture asking the viewer to share in the expression of forgiveness. The soft shadows of the entire composition add to the personal reflective nature of the painting. All figures seem to be sympathetic toward Rembrandts’ "prodigal son" except the immediate figure to the right whose face is highly illuminated by a different light source other than that of the father and the son. This seems to say not everyone here is in agreement with accepting the son back into the household. Other famous artists of the Baroque art period are Frans Hals, and Diego Velazquez. To view the entire gallery of Rembrandt paintings, click here.